Dumfries Women lost their Women’s National League match at Nunholm on Sunday against St Boswells thanks to notable individual performances from the visitors. 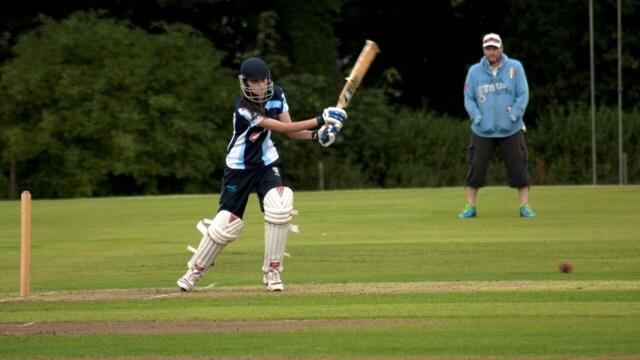 St Boswells were asked to bat and Dumfries had a useful start from opening bowlers Kirsty Strachan and Sue Jeffrey. Strachan claimed two wickets in her opening overs, one courtesy of a fine diving catch by keeper Ali McCubbin. However those wickets were perhaps a tactical error since they brought Scotland all-rounder Kathryn White to the wicket. She showed her experience, as did her partner, opener Rebecca Waldie, also with a Scotland pedigree, in putting together a big partnership. Despite the efforts of the bowlers, aided by good fielding, they were unable to get the necessary wicket to hopefully open up an end. The pair were still there at the end of the twenty overs having reached a sizeable 151 for 2. White finished 83 not out after an innings which was a pleasure to watch, and which included twelve boundaries. Waldie was also unbeaten on fifty. Dumfries batted well in response and openers Kirsty Strachan and Rachel Howard had put on twenty eight when Strachan popped up a slower delivery for a caught and bowled in White’s final over for a score of 15. Howard followed soon after for 19, the first of three wickets for Waldie, and skipper Sue Strachan was another after adding a rapid ten. The total was not really in prospect but Sue Jeffrey, the Parkdale Garage Dumfries Player of the Match, kept the scoreboard ticking over with 23 not out. She was aided by contributions from Ali McCubbin and Phillippa Benson. The innings reached the hundred, exactly, for the loss of five wickets after a good effort by the Nunholm side which included a first bowling experience for Naomi Cowan and a debut innings for Amy Hunter.